The following contains spoilers for Creed. You have been warned. James: We are here to talk about Creed. Before we get into Ryan Coogler’s sequel/spinoff (franchise lingo is very confusing), I think since the movie plays really into the Rocky mythos, that’s a good place to start. I’m curious what your relationship is to the franchise- do you consider yourself an ardent follower of the series as a whole? Tyler: I will be there opening weekend for every movie in the franchise but I think that has more to do with my affinity to sports movies than Rocky itself. I don’t know if I have ever seen a Rocky movie start-to-finish more than once. This has a lot to do with the constant cable marathons that were very prevalent when I was growing up. That being said I do love the films, particularly I, III, and IV. What’s your relationship with the franchise? James: I’ve always been a bit of a Rocky agnostic. I admire the first film quite a lot but it’s always enraged me (perhaps from even before I watched it the first time, which isn’t fair but I wear my movie geek hat with pride) that it won Best Picture over All the President’s Men, Network and Taxi Driver. It’s a strong movie but that just seethes me to my core. The endless sequels have never really appealed to me- I’m not sure if I’ve ever seen any of them all the way through once. Which brings us to Creed, which for me, is one of the biggest surprises of the year. Despite my Rocky allergy, from nearly the start, the movie grabbed me and pretty much completely won me over. Did Creed resonate with you pretty much instantly as it did for me? Tyler: Leading up to its release, particularly with the Fruitvale Station team of actor Michael B. Jordan and director Ryan Coogler (Fruitvale Station) onboard, I talked myself into the idea that this movie could be good or at least as good as Rocky Balboa (which was better than it should have been). Suffice it to say I was “grabbed” before I went to the theater. We’ll get into his performance in a bit but I will watch anything Jordan does just because I have followed and, for the most part, enjoyed everything he’s done since the first season of The Wire. It wasn’t until we see him in the ring, in Mexico, that I was right there with the film. Watching him bite the tape off his gloves before his opponent is declared down for the count amped me up enough to carry me through the film. The series has always been great at building excitement, what was the first moment that did it for you? James: I was pretty much on board when Phylicia Rashad showed up to adopt young Adonis (Alex Henderson as a child; Jordan as an adult). That may just be because she’s a performer that always wakes me up no matter the part. However, the Mexico fight sequence is like the fourth or fifth scene in the movie, so Creed certainly seemed to do a good job of grabbing both of us pretty early. 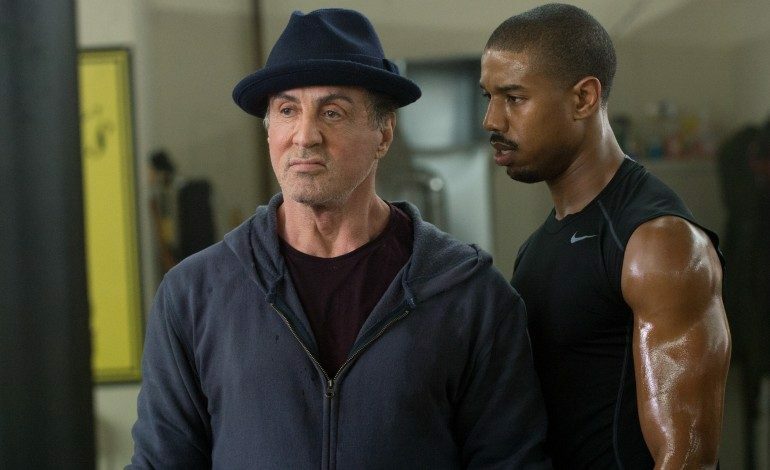 I find it really fascinating that it Coogler (who made his debut with Fruitvale) was the one who pursued Stallone (who was initially reluctant) for Creed. Something personal about this series must have struck Coogler and it shows in the filmmaking because nearly every frame and performance feels so alert. At first, I chalked my excitement for Creed because my expectations were pretty low but that the film has continued to resonate with me emotionally speaks, I think, to the power and precision of the filmmaking. It’s easy to discount a Rocky movie because it just is and it’s easy to sort-of write off a movie that’s hews to a formula, but smart, genuinely crowd-pleasing movies like this are exceedingly hard to pull off. Tyler: There is a feel to the series that definitely makes it a part of its time – Rocky single-handidly ends the Cold War in IV – but at its core, the first film is about someone in the lower class trying to better themselves in some way. People forget that at the start of Rocky, he’s muscle for a low-level mobster. Coogler tackled similar themes in Fruitvale as a large portion of that movie is about Oscar Grant trying to turn over a new lease on life. What’s interesting about Creed though is that Adonis has gotten out of the foster care system by the time he’s an adult, thanks to Mary Anne (Rashad) adopting him. Instead of overcoming a socio-economic status or a criminal background, Adonis wants to make his own name for himself and get out of the lifestyle he has available to him. James: It’s an interesting turnaround and I think Coogler does a good job of expressing the idea of Adonis’ need to be a boxer. That’s his passion and works as a metaphor for anyone with an inarticulate desire to be or do something. To the strength of Coogler’s filmmaking and Jordan’s performance, that idea never feels overwrought or strenuously underlined. It’s interesting to note the similarities between the first Rocky and something like Fruitvale Station in the idea of characters on the lower end of the socio-economic scale trying to break out. In a way, the first Rocky was a very economic character study- almost an art film. It’s weird that we’ve gone this far without really talking about Stallone. What was your impression of him in the film and did it change any feelings for you about this nearly 40-year-old character? Tyler: I was fascinated with the way the movie portrayed the character long after his career. We got a lot of that in Rocky Balboa with him running the restaurant – though it looked like the restaurant Adrian’s had fallen on hard times in Creed – but similar to how Stallone wanted to “fix” the ending of the series with another film; Rocky wanted one more night in the ring. For a good chunk here, Rocky is portrayed as being entirely done with boxing. Of course, we know he will come back to train Adonis but for a series that is so focused on “the big fight,” I really enjoyed seeing the character outside that world. I think that would be a good transition to discuss the performances and I would like to start with Stallone, what did you think of his seventh turn as the character and do you think he deserves all the awards buzz he’s been getting? James: It’s easily the best performance of his career, I would argue. I’ve always kind of seen Stallone as a joke just due to my age and all the Rambos and Expendables and its ilk. For me, it was a sort of a revelation to see Stallone infuse so much soul and lived-in humanity here. Again, I’m not really a huge Rocky devotee so maybe it’s always been there but I felt a sensitive and subtle alertness to his performance in Creed as well as a rumination of the character as a whole- Stallone has been playing him now for decades now. On the awards angle, I think it could definitely happen and I certainly wouldn’t be upset. Tyler: This is the first time I can remember him playing a character befitting of his age where he isn’t bulked up or trying to look that way which makes him much more welcoming as an actor in a weird way. Given the seemingly weak supporting actor contenders and that Stallone is very good in the film, I think he’s a lock for a nomination and likely the sentimental choice for the award. It all goes back to the first film as the Academy – and America – loves a comeback story and it would be fitting for Stallone to win. Changing lanes, what did you think of Jordan as Adonis Creed? It seems like the world, especially me, has been waiting for the big mainstream breakout for Jordan since Fruitvale or even longer. I hoped that at the very least, he would get that in Fantastic 4 but this is definitely making the world take notice. James: Stallone could win unless the Spotlight guys take over the category. On terms of Jordan, he’s pretty incredible through and through. I’ve been a fan of his for a while (The Wire, Friday Night Lights), so it’s wonderful to see a rising actor start to come into his own and despite the pitifulness of Fantastic 4, I never really worried about his trajectory. What’s refreshing about his performance is what’s refreshing about the entire film- even when we can predict and easily pinpoint where it’s going, there’s a freshness that’s unexpectedly involving. The best moments in Creed, somewhat ironically, take place outside the ring I think. Did you feel the same way? Tyler: I agree, particularly the scenes with Tessa Thompson who plays Bianca, his neighbor-turned-girlfriend. The “cheesesteak scene” has been getting a lot of attention because it’s a pure character scene, especially for her. We have spoken a lot about how the film follows a very similar trajectory to the first film but that scene is one instance that improves upon it. The similar ice skating scene in the first film is there to reinforce that Rocky likes Adrian but the scene here is about these two people getting to know each other. The same can be said for the scenes surrounding Rocky’s illness. Those scenes really build the relationship of Rocky and Adonis outside of the trainer-fighter dynamic – though that’s there too. What did you think of Thompson? James: Thompson was really strong and her character again speaks to the richness of the Coogler’s vision. Of course, Adonis gets a girlfriend (Rocky had Adrian) but it was nice to see that Bianca wasn’t just the stock “girlfriend.” The role might have felt a little underwritten here and there but Bianca has an interior life outside of Adonis (she’s a fairly successful musician) and never really felt like she was there just to be Adonis’ ringside prize at the end. Most of the success of the character probably speaks to Thompson’s charisma as a performer but it speaks yet again to Coogler trying to go the extra mile and create a world here that’s realistically defined. Rocky and Adrian are classic characters and there’s something truthful to their relationship in the first Rocky, yet that’s something in the last forty years of movies clearly made in the Rocky mold have somewhat forgotten how to handle with care and grace. Since Creed clearly excelled on a character angle, what about the fight scenes! What did you think? Tyler: The fight scenes are excellent. It says something that the audience I saw the film with, wanted Creed to be able to finish the fight despite it being clear that, medically, he shouldn’t have kept fighting. The final fight felt like gravy on an already great movie for all the reasons we previously mentioned. I loved it though, as well as the one-take fight, earlier in the film. It was with those scenes though where I was really happy to see something from Coogler that I hadn’t scene in Fruitvale. I knew he could bring the character development and get great performances from his actors but I was very excited to see him bring similar directing skill to the fight scenes. James: The one-shot fight scene was a pretty spectacular marvel (quick geekly shout out to Creed’s DP Maryse Alberti, who has done some incredible work in the past with movies I adore in the past including Velvet Goldmine and The Wrestler). As I previously mentioned, the best scenes in the film are mostly set outside of the ring. I was more than fine with the matches themselves but nonetheless couldn’t get too involved with ‘Pretty’ Ricky Conlon (played by real-life boxer Toy Bellew), Adonis’ ultimate brawling foe. While everything else in the movie felt pretty genuine and seemed to go out of their way to breakout of established troupes, he felt like a stock character. Tyler: I agree with you on the Conlon character but I think we can both agree it’s a very minor flaw in a film with which, we were otherwise very impressed. James: I wouldn’t even go so far as to say it’s a flaw, it was just there. The final set piece still works on an emotional level and the entire movie works to not just play into the Rocky mythology but also extend and enhance it. What’s so moving and impressive about Creed is the confident way Coogler seemingly defied expectations in nearly every stride. Even as a non-Rocky believer, my eyes started to well up a bit as Adonis was jogging down the streets of Philadelphia as the immortal Rocky anthem started to swell on the soundtrack.